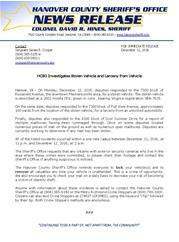 Hanover, VA – On Monday, December 12, 2016, deputies responded to the 7300 block of Roosevelt Avenue, the downtown Mechanicsville area, for a stolen vehicle. The stolen vehicle is described as a 2002 Honda CRV, green in color, bearing Virginia registration VBA-7625. On the same date, deputies responded to the 7300 block of Full View Avenue, approximately 100 yards from the location of the stolen vehicle, for a larceny from an unlocked automobile. Finally, deputies also responded to the 8100 block of Cool Summer Drive for a report of multiple mailboxes having been rummaged through. Once on scene deputies located numerous pieces of mail on the ground as well as numerous open mailboxes. Deputies are currently working to determine if any mail has been stolen. All of the listed incidents occurred within a one mile radius between December 11, 2016, at 11 p.m. and December 12, 2016, at 2 a.m. The Sheriff’s Office requests that any citizens with exterior security cameras who live in the area where these crimes were committed, to please check their footage and contact the Sheriff’s Office if anything suspicious is noticed. The Hanover County Sheriff’s Office reminds everyone to lock your vehicle(s) and to remove all valuables any time your vehicle is unattended. This is a crime of opportunity. We also encourage you to check your mail on a daily basis to decrease your risk of becoming a victim of identity theft.